Would you like to enhance communication with your patients so they can better understand their Psychiatry and the pathologies associated to it? Would you like to always carry in your pocket a powerful tool with many comprehensive images related to this phenomenon? If so, the Miniatlas Psychiatry is here to help you in your daily practice. Psychiatric disorders are a common cause for consultation in primary health care centers. Your patient might come in to see you for reasons as diverse as the persistent anxiety that is interfering with his daily functioning, recurrent feelings of sadness and worthlessness that are deteriorating his relationship, or perhaps because of the early manifestations of a schizophrenic disorder that have him and his family members worried and scared. The causes can be different, but there is always the need of the patient to talk about it. He also has many questions to ask you and needs and expects satisfactory answers to all of them. In addition, because of the burden these diseases have on the patient's relatives and loved ones, it is very important that those too understand the disease, to provide the essential support to better deal with the psychosocial factors involved in psychiatric disorders. However, the social stigma and lack of knowledge associated with these disorders might make sometimes embarrassing or difficult to discuss them in the consultation. There is a powerful tool that will help you improve communication in these situations. 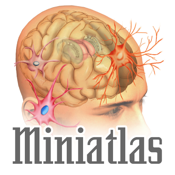 The Miniatlas Psychiatry app is a complete collection of medical images related to the most frequent psychiatric disorders, that will allow you educate your patients about what is happening to them and also listen to their worries an concerns.This app will not only make your patient easier to understand his disease with the help of its clear explanatory images, it will also enable you to always have at your reach a comprehensive and referenced review of the anatomy, physiology, pathology and therapeutics of the specialty for your own consultation. Help your patient take control of the disease through knowledge and information. Use the app with your patients and peers to provide clarity and save time. You see? Everything is covered and in great detail. Once you start using the Miniatlas Psychiatry with your patients, you’ll never want to be without it again.